Select which page type best matches the step in your funnel. Landing Page – Does not count toward conversion ratio, displays total visitors. 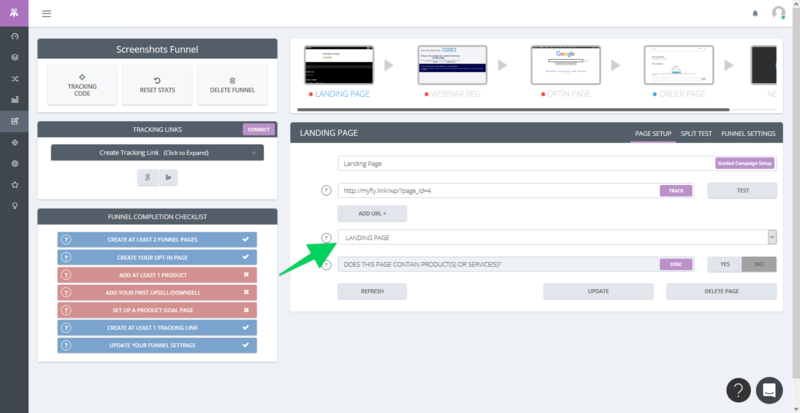 Optin Page – Leads calculate only when a unique visitor hits this page and then lands on any following page. Confirmation Page – Page after registration confirmations, Opt-in confirmations etc. This does not count towards sales conversion ratio, instead, it counts towards traffic. Sales Page – Only contributes to conversion ratio when a sale is credited on this page. Order Page – Conversion ratio is traffic based to monitor order form drop off. Upsell Page – Same as Sales Page. Downsell Page – Same as Sales Page. Non-Conversion Page – A standard page with traffic based conversion ratios. Thank You Page – Does not contribute to conversion ratio, displays final visitor count.